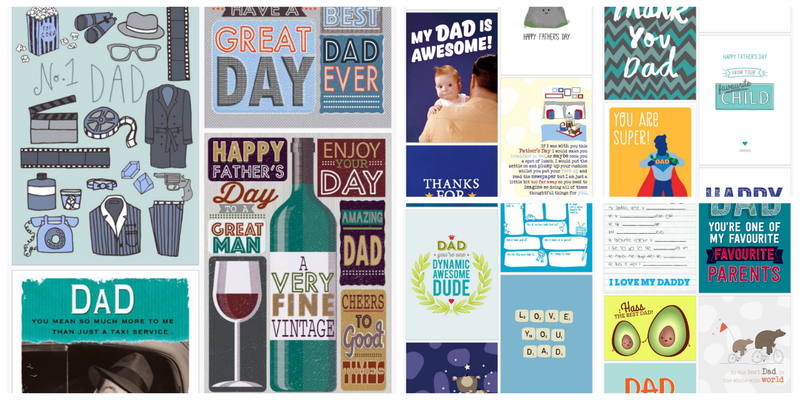 REVIEW | THORTFUL FATHER'S DAY CARDS. When the guys at thortful Greetings Cards, got in touch about reviewing their Father's Day cards, I immediately agreed. The range of cards is huge and seems to cater for every niche. They even had Father's day cards to give to your mum, if she has been around for you, in your life, when your dad has not...touché! The cards are chosen and then edited by the customer, on-line, and then the real deal is posted out, first class and on the same day of ordering, if it's before 2:00 p.m., so there's still plenty of time to order one for this weekend. To start the process off, I had to download the thortful app from the app store or google play. Once it's downloaded, you are met with this screen. Obviously, if you scroll down, there are many occasions to choose from, but I selected Father's Day. Next, you need to then pick the style of card, you require - there are lots and I have only captured a small selection here. There are styles to suit all tastes, funny, serious and even some containing swear words, which aren't to my taste, but still they are available. I selected this one for my husband from Harry and Matthew, who are 3 at the moment, so I thought it was quite fitting. As you can see, the cards cost £2.99 and the price of a first class stamp. The thing I really like about these cards is that you can order at any time and any place and so long as you have ordered before 2:00 p.m. you will receive it the next day. This is perfect for those times when you have forgotten an event and need a card quickly, but haven't got the time to hunt around for one. The other thing that I like, is that you can personalise the message inside, to suit the person who is receiving the card. 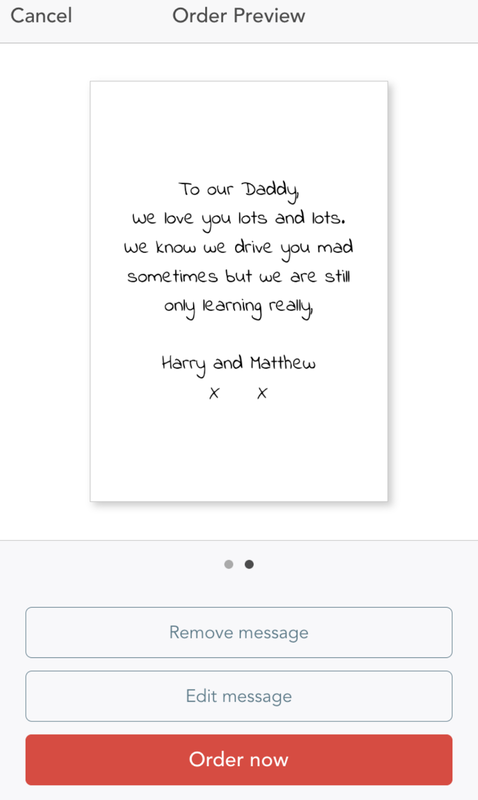 This is the message I wrote inside of Harry and Matthew's card. There was a great selection of fonts to choose from too. At the 'Order now' stage, you simply add your delivery address and pay using your bank card. You can choose whether the card is sent to you, to pass on, or it can be delivered straight to the recipient. I think this is a great feature. The next day, the card arrived, and this is what it looked like. The envelope was heavy weight quality and the actual card was of a really high quality. I was very impressed. I wouldn't hesitate to order from thortful again. The cards are great. Have you got your Father's Day card yet? 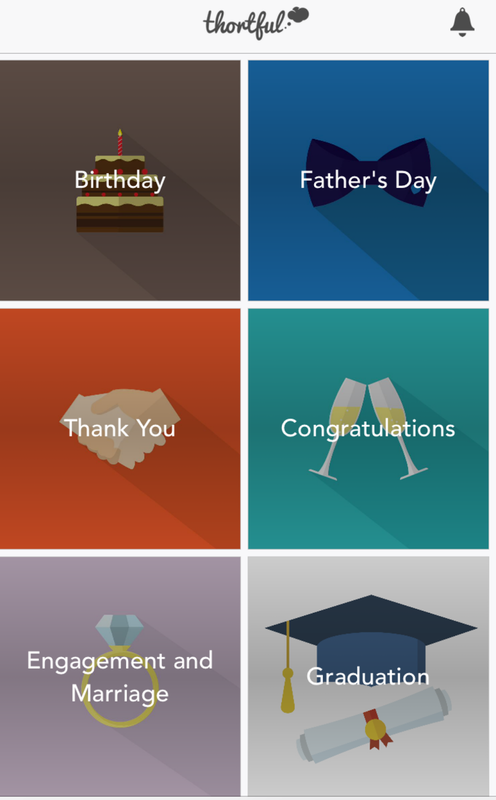 I was given a code to access a Father's Day card, on-line, for free.